After 11 days of street protests by anti-government demonstrators, Prime Minister of Armenia Serzh Sarksyan has announced his resignation. President of Armenia Armen Sarkysan (of no relation to the embattled prime minister) accepted the resignation on Apr. 23 while the governing coalition named Karen Karapetyan — First Deputy Prime Minister and a close ally of Serzh Sarkysan — the acting prime minister until a new candidate is elected by the Armenian parliament. Serzh Sarkysan previously served ten years as President of Armenia after being elected in 2008 and re-elected in 2013. His Republican Party of Armenia (HHK) has dominated Armenian politics for the past decade, which allowed him to pass a package of constitutional amendments to transform the semi-presidential republic into a full parliamentary republic in 2015. Under the old Constitution of Armenia, the President was limited to two five-year terms and had a larger share of executive powers split with the Prime Minister. The 2015 amendments reduced the President, now term-limited to one seven-year term, to a ceremonial role and transferred extensive executive authority to the Prime Minister, who is not term-limited. Per the language of the approved amendments, the changes to Armenia’s constitutional order would take place after the end of then-President Serzh Sarkysan’s second and final five year term in 2018. On Mar. 2, 2018, the HHK-dominated National Assembly elected Armen Sarkysan to succeed Serzh Sarkysan as President under the new constitutional order. The new ceremonial President was sworn in on Apr. 9 while the parliament set Apr. 17 as the date to elect a new executive Prime Minister. Protesters took to the streets on Apr. 13 after rumors circulated that ex-President Serzh Sarkysan was to be elected Prime Minister. Opposition forces rallied for “an Armenia without Serzh Sarkysan” while observers drew parallels between Sarkysan’s maneuvering to stay in power and current President of Russia Vladimir Putin’s alternation of the posts of President and Prime Minister to circumvent term limits and retain power. Protests intensified after Serzh Sarkysan was formally elected Prime Minister by the National Assembly on Apr. 17. Amid calls for dialogue from the government, demonstrations continued in downtown Yerevan, capital of Armenia, while smaller protests cropped up in other cities. Armenian police used force and conducted mass arrests in a futile effort to break up demonstrators, which drew a sharp rebuke from the European Union on Apr. 21. After President Armen Sarkysan personally visited protest leaders in downtown Yerevan on Apr. 21, opposition leaders reported that Prime Minister Serzh Sarkysan was willing to discuss a “peaceful transfer of power.” However, in tense televised talks with opposition lawmaker Nikol Pashinyan, Prime Minister Sarkysan accused the opposition of “blackmail” and stormed out of the meeting. Pashinyan was detained by security forces after the talks. Demonstrators rallying on Apr. 22 to demand the release of Pashinyan and the resignation of Prime Minister Sarkysan were bolstered by white-coated medical students and unarmed uniformed soldiers. Images broadcast over social media showed university students arm-in-arm and soldiers hugging protesters and waving Armenian flags. Pashinyan was released on custody on Apr. 23 shortly before Prime Minister Sarkysan announced his sudden resignation, stating “Nikol Pashinyan was right. 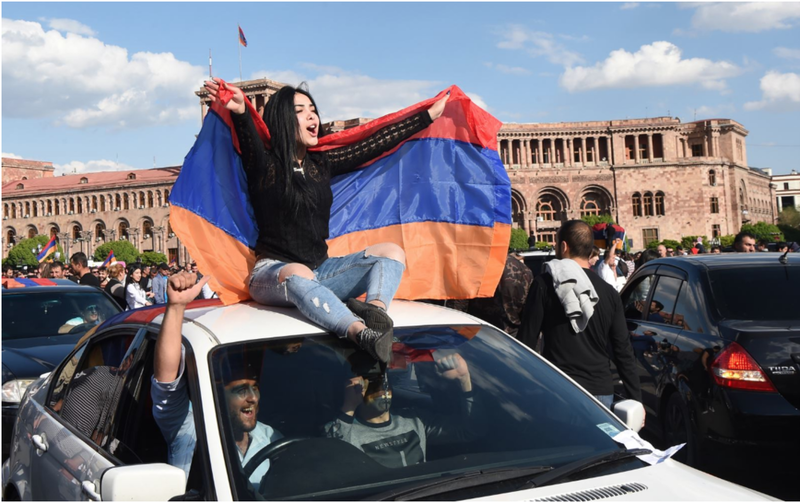 I was wrong.” Pashinyan rejoined jubilant protesters in downtown Yerevan and pledged to “ensure a transfer of power to the people” before calling on the HHK to “unequivocally recognize the popular velvet and non-violent revolution” and hold fresh parliamentary elections. In a show of unity, Armenians gathered on the following day to commemorate the victims of the 1915 Armenian Genocide. Acting Prime Minister Karapetyan appealed for unity ahead of talks with Pashinyan set for Apr. 25 while the Russian Foreign Ministry praised the transition for being peaceful and appealed for stability.